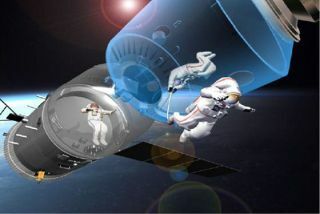 China is gearing up for its third manned spaceflight, set toinclude its first ever spacewalk, later this month. The three-member crew is not yet named for the Shenzhou7 mission, due to launch sometime between Sept. 25 and Sept. 30 fromJiuquan Satellite Launch Center in Gansu Province, China, but a spokesman for the launch center told the Shanghai Dailynewspaper that preparations were on track for liftoff. "All the major systems involved in the launching arenow in final preparations," the newspaper quoted the unnamed spokesman assaying last week. "The main tests for the spacecraft, the Long March 2Frocket, suits for the space walk and a satellite accompanying the flight havebeen finished." In the days leading up to the mission the crew has been busyconducting drills and making final preparations, and are all in good physical andmental condition, he said. Sea search and rescue teams have also beenrehearsing plans to rescue the astronauts if any accident should occur duringlaunch to cause the reentry capsule to fall into sea, the state-owned Xinhuanews service reported. In a bold gesture of confidence, China hasannounced plans to broadcast the spacewalk live. The Shenzhou spacecraft isset to carry its own small satellite, which could be automatically released fromthe vehicle or let go by astronauts during the spacewalk, to beam footage backto Earth, state media reported. The satellite is equipped with charge coupleddevice (CCD) cameras to capture the historic moment when the spacewalker stepsinto space. China's first spaceflight, the 2003 launch of the Shenzhou 5mission, made it the third country, after Russia and the United States, tolaunch a person into space on its own. Chinese astronaut Yang Liwei orbited theEarth 14 times during the successful 21-hour flight. In 2005, China launched the Shenzhou 6 mission, a five-dayflight and the nation?s first with two astronauts aboard. China's Shenzhouspacecraft are based on Russia's three-module Soyuz vehicles, but have beenmodernized by Chinese engineers. They include an orbital module that can remainin space to carry out experiments after the crew returns in the reentry module.The orbital module is outfitted with solar arrays to supply it with power, andcould become the base for a space station or a docking target for futurespacecraft. This third spaceflight was originally scheduled for the endof October, but was moved earlier so that the position of the sun would enable the spacewalkto be performed in sunlight, rather than darkness, China Daily reported. The five-day mission is aimed at continuing China's journeytoward the goal of exploring space and eventually landing on the moon, Chinese space officials have said.